ETS has produced new magazines for the Glock 42 and 43 (here the 7-round 9mm flush magazine). 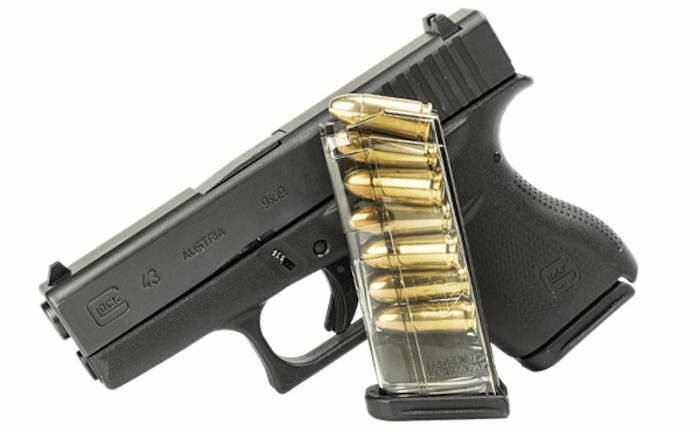 Elite Tactical Systems (ETS) has recently released new Glock magazines for the very popular concealed carry targeted Glock 42 in .380 caliber, and Glock 43 in 9mm. These magazines are a continued expansion by ETS to produce a full line of Glock magazines. Though many non-OEM magazines do not live up to advertised expectations, the ETS magazines have received mostly good reviews from reputable sources, like RECOIL. Previously, ETS has released various capacity Glock magazines for 9mm, and .40 S&W. The BlueSheepdog has had the opportunity to shoot and review multiple versions in both 9mm and .40 S&W and so far have found them to be reliable, well-made, and durable. The Mag Pump uses a hopper to quickly load magazines. 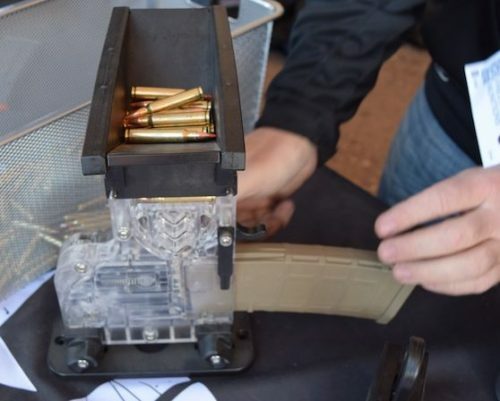 One of the coolest gadgets I saw at the Industry Day at the Range was the Mag Pump AR-15 ammunition loader. This ammunition loader is well designed to quickly load Mil-Spec AR-15 magazines. In fact, the Mag Pump was actually at several vendor’s booths, and everyone I talked to had very positive comments about its performance. 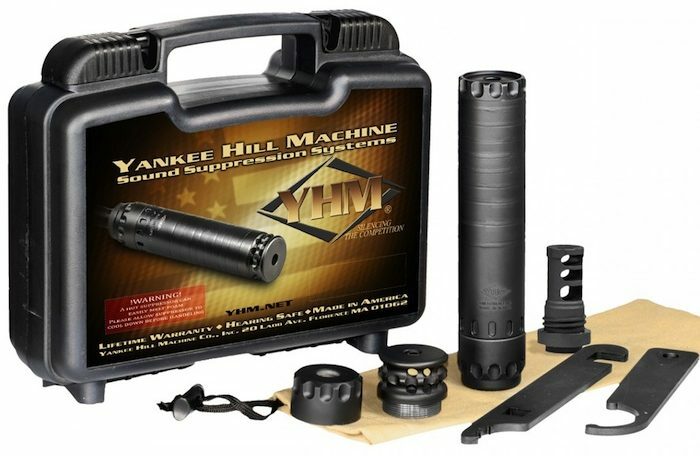 The Mag Pump is designed to load AR-15 magazines very quickly through a manually loaded hopper system. The design relieves shooters of excessive finger and hand fatigue during a long day of shooting. This speed loading capability was particularly helpful during the Industry Day at the Range, where hundreds of media and industry types are shooting the latest firearms. I’ve seen booth representatives towards the end of the day exhausted and with beat up hands and fingers. The Mag Pump appeared to be universally praised for relief and help in loading magazines. The PRS Gen 3 is designed to enhance the long-range shooting experience. Magpul continues to produce new and enhanced products in fever pitch, and the introduction of the Generation 3 Precision Rifle/Sniper (PRS) stock is just one of those additions. The PRS Gen 3 maintains the integrity of previous PRS models while looking to enhance some of the finer features to create and even more enjoyable and functional shooting experience. One of the snipers on my SWAT team had an earlier version of the PRS on an AR-10. His experiences with the PRS were very positive, as the stock was designed to personalize the positioning of the shooter to the rifle, and could be accomplished while on target. Considering the popularity of Magul products, including the PRS line, I am confident that the new PRS Gen 3 will be another winner for one of the strongest rifle accessory companies in the world. Magpul has recently announced the release of (2) new buttstocks. The MOE SL-S AR-15 stock is an adjustable AR-15 stock with flared cheek welds, QD and traditional sling attachments, and dual storage compartments. The MOE SL-S AR-15 stock is another advancement to the MOE line of highly effective and popular AR-15 adjustable stocks, and should be just as popular as its predecessors. Magpul has been on overdrive since last year’s SHOT Show, producing new products at fever pace. The new SL-S AR-15 stock is very interesting to me for several reasons that I will outline below. HERA Arms has produced some very appealing AR-15 furniture. HERA Arms (High-grade European Research for Small Arms) has developed some incredibly nice and unorthodox component options for the AR-15. Not only are their CQR components uniquely attractive, but they serve several legitimate purposes beyond their aesthetic appeal. With the incredible expansion of everything AR-15 over the last decade, there is no shortage of gimmicks and simply outrageous accessories. The more popular the firearm, the more gadgets appear. The HERA Arms CQR components appear to be much more than just attractive, futuristic-looking AR-15 components. With an eye for designing outside the box, HERA has developed a unique system that may become extremely popular for their versatile features, and multi-purpose functions. 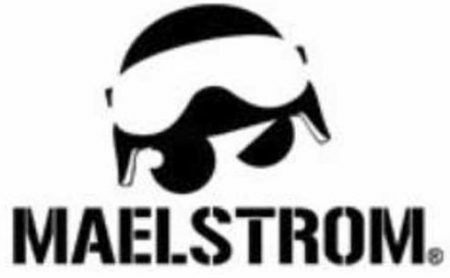 Maelstroms logo appears to be a no-nonsense SWAT guy. Maelstrom Tactical is a company dedicated to providing duty related uniform items. One of their most popular items are the TAC FORCE 8″ Boots. Designed specifically for law enforcement and other first responders, the TAC FORCE 8″ boots combine leather and nylon materials with reinforced support and YKK zippers. The TAC FORCE 8″ boots provide users a pair of duty boots that are comfortable, professional in appearance, and supportive for the rigors of duty activities. 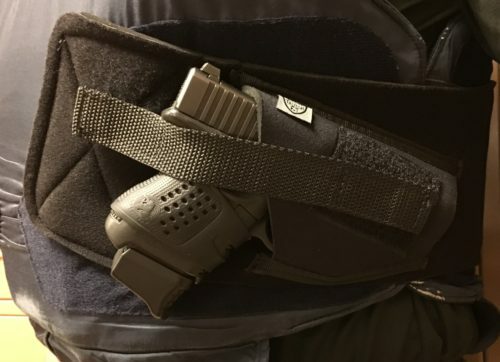 A couple of months ago Maelstrom Tactical reached out and asked us to perform a review of the TAC FORCE 8″ boots for our readers. This article is a culmination of our experiences with these Maelstrom boots during our on and off-duty testing. The FAB Defense AR-15 Podium can provide great support at the rifle’s mid section. FAB Defense, a part of the larger Mako Group, has produced the AR-15 (and AK-47) Podium. The FAB Defense AR-15 Podium is a combination pistol grip and bipod, and is another innovative accessory produced by one of Isreal’s leading arms accessory manufacturers. The AR-15 Podium is designed to assist AR-15 shooters in establishing a solid shooting platform, without the use of bulkier and slower deploying bi-pods or bags. FAB Defense has been in business for over 50 years. The FAB Defense AR-15 Podium is a one-piece pistol grip replacement for the standard AR-15 pistol grip. In addition to upgrading the shooter’s pistol grip with a better contoured and textured FAB Defense AGR-43 replacement grip, the AR-15 Podium includes an integrated base plate that attaches to the magazine well to form a very stable enclosed platform. The base plate runs horizontal, and can be used as-is for a shooting support platform. However, the base plate also contains (2) foldout bi-pod legs that can provide an even more balanced shooting platform.